Spartak Moscow Region opened the third round of the EuroLeague Women competition with a road victory against Fenerbahce (88-74). Once again Diana Taurasi was the star of the match with 29 points, 7 rebounds and 6 assists. Mixed fortunes had the three French clubs all playing at home with 1 victory and 2 defeats. Frida Eldebrink (left) hit 7-of-9 from behind the arc and scored a total of 23 points. But it was not enough for Tarbes as they lost (62-70) to Frisco Sika Brno. Villeneuve d'Ascq also lost (71-77) to Wisla Can-Pack, while Bourges Basket cruised past MKB EuroLeasing (82-56). In the other EuroLeague Women games played on Wednesday starting with Group A, Ros Casaras, with Becky Hammon making her début, beat UMMC Ekaterinburg (87-68). TTT Riga lost at home to Cras Basket (59-70). ZVVZ USK Prague beat KSSSE AZS-PWSZ Gorzow (96-79) in Group C.
MiZo Pécs 2010 lost the first game on Thursday evening to last season’s finalist Halcon Avenida (60-69). Galatasaray remain unbeaten after a comfortable victory against TEO Vilnius (82-55). Five clubs are unbeaten with 3 wins from 3 matches, Spartak Moscow region still has one game to play. 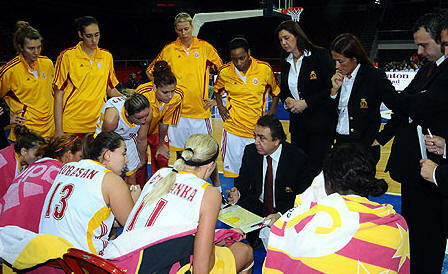 Galatasaray remain unbeaten after defeating TEO Vilnius (82-55). Playing at home Galatasaray got off to a flying start and led (10-2) with less than four minutes of the scoreboard. They then took their foot off the accelerator and allowed TEO back into the game. Galatasaray went into the second period leading (20-15), but their guests drew level within three minutes after a trey from Chioma Nnamaka (22-22). The teams remained level (26-26) for a couple of minutes before Sophie Young and Nilay Yiğit combined for 9 straight points. Esra Şencebe finished the scoring spree with back to back three-pointers as the hosts went into the locker room ahead (41-28). They were not troubled for the rest of the match and won comfortably with Jia Perkins scoring 23 points. Renee Montgomery fired in 21 points for TEO. Ros Casares, playing at home, scored the first 12 points of the match. They did not allow UMMC Ekaterinburg to settle. They went on to win the game (87-68) with Delisha Milton-Jones (left) and Laia Palau scoring 19 points apiece to lead the scoring for the Spanish team. UMMC used up a lot of energy chasing the game. With just over six minutes left to play in the game and trailing (64-67) they ran out of gas. Ros Casares took full advantage and finished with a 20-4 run to win comfortably. TTT Riga’s EuroLeague Women campaign is not going well after losing again. They were defeated at home (59-79) to Cras Basket Taranto. Cras Basket led from start to finish in this game. After scoring the first 10 points of the match they never looked back. They had a maximum advantage of 23 points during the final quarter before settling for an 11-point victory. Rebekkah Brunson and Jami Montagnino led the scoring with 17 points each for the Italian side as they recorded their first victory in this EuroLeague Women competition. French international Elodie Godin scored 8 points and pulled down 14 rebounds while Belgium star Kathy Wambe scored 7 points and dished out 4 assists. For TTT Riga, new signing Lisa Willis led the scoring with 14 points and Spanish international Cindy Lima added 10 points and captured 7 rebounds. Wisla Can-Pack made it 3 wins from 3 matches after beating Villeneuve d’Ascq (77-71) to remain undefeated in the EuroLeague Women competition. Villeneuve d’Ascq failed to make an impact in the paint and made just one trip to the free-throw line during the whole game. However Ewelina Kobryn from Wisla Can-Pack hit 10-from-11 shots from the free-throw line in her game high 24 points, she also picked up 10 rebounds in her player-of-the-match performance. Villeneuve led (20-13) at the end of the first period and were still in front (28-20) with 14 minutes played. Wisla Can-Pack took control with a 14-0 run in a space of four minutes to take the lead for good (34-28) after 18 minutes. Villeneuve huffed and puffed for the rest of the game but did not have the luck to swing the game. Elodie Bertal and Lady Comfort scored 15 and 14 points respectively while Jolene Anderson scored 10 points, took 10 rebounds and dished out 6 assists in the defeat. MiZo Pécs 2010 EuroLeague Women misery continues with another defeat. They lost at home to last season’s finalist Halcon Avenida (60-69). The winners were well served by Le'Coe Willingham (right) and Isa Sanchez who scored 17 points apiece. In a tight match that had the hosts leading at the interval (36-34), it was the steady free-throw shooting of the guests from Spain, 16-from-19, that made the difference in the end. MiZo Pécs 2010 managed only 6-from-13 with unlucky Nicole Ohlde managing 0-from-5 although she scored 12 points. Zsófia Fegyverneky and Olga Podkovalnikova scored 15 and 14 points each for the hosts. Laura Macchi with 23 points led Beretta Famila to victory against Gospic Croatia (91-76). Nicole Antibe added 16 points as the Italian side remains unbeaten in the competition. MKB EuroLeasing started strong and matched Bourges Basket for the first three minutes (8-8). Bourges Basket, urged on by their fans, started to take command of the game and scored 8 unanswered points (16-8). However they became a little careless and turned the ball over a couple of times with MKB scoring the last 6 points of the quarter. Leading (16-14) at the start of the second quarter, Bourges quickly took control and opened the first significant advantage of the game (32-21) with 15 minutes played. Bourges continued to press and by the interval they led (42-25). They were not troubled for the rest of the game and went on to win (82-56). Ilona Burgrova led the way with 15 points for Bourges Basket. Paoline Salagnac added 13 points and was responsible for 5 assists while Essence Carson added 10 points. ZVVZ USK Prague allowed their guests from Poland KSSSE AZS-PWSZ Gorzow to score the first 4 points of the match. ZVVZ woke up and scored the next 8 points to go in front. They dominated the rest of the quarter to finish with an 11-0 run (23-11). They were never in any danger for the rest of the game as they won comfortably (96-79) with 25 points coming from Katerina Elhotova. Angel McCoughtry made her EuroLeague women début for Good Angels Kosice and top scored with 19 points. However this was not enough to beat Rivas Ecópolis. Rivas Ecópolis won (74-58) and are the only unbeaten team in Group C.
In the final quarter Spartak Moscow Region were not having it all their way and were trailing (68-66). Diana Taurasi (left) then stepped on the accelerator and provided the perfect pass to Edwige Lawson-Wade who hit a rainbow three-pointer. 30 seconds later, Taurasi found Anete Jekabsone-Zogota in almost the same position as Lawson-Wade. Jekabsone-Zogota did not waste the opportunity and fired in a three-pointer for her side to go in front (72-70). However Taurasi was not finished: she managed to get Nicole Powell to foul her twice while going for three-point shots. Taurasi said thank you very much and went 6-from-6 from the free-throw line. With five minutes to play Spartak Moscow Region were 10 points clear (80-70) and not to be troubled for the rest of the game. They went on to win (88-74). Fenerbahce have a strong EuroLeague Women roster and made things difficult for Spartak Moscow Region. They made 24 trips to the free-throw line and connected 21 times. Yet they finished with just 3-from-16 from beyond the arc. Penny Taylor and Powell led the scoring 21 and 19 points each for the hosts. Taurasi was the player of the match with 29 points, 6 assists and 7 rebounds. She was also credited with 7 turnovers. Jekabsone-Zogota (right) fired in 18 points. Three other players from Spartak also finished in double digits with Sylvia Fowles, Janel McCarville and Lawson-Wade with 13, 12 and 10 points apiece. Tarbes scored on their very first attack through Anne Breitreiner with less than four seconds on the game clock. Yet Hana Horakova (19 points and 5 assists - left in picture) replied on the next attack for Frisco Sika Brno. Eva Vitecková (10 points) and Horakova were very active for the guests as they moved ahead (6-3) with just over two minutes played. Isabelle Yacoubou-Dehoui was battling at both ends of the court for Tarbes. She scored inside the paint before handing over the offensive duties to Frida Eldebrink, who scored twice from beyond the arc as Tarbes regained the lead (10-6). Horakova was unstoppable during the first period and added 8 points to her tally as Frisco Sika Brno won the first quarter (20-14). The guests stepped on the turbo at the start of the second period and scored 6 points within 60 seconds to open up the first significant advantage of the game (26-16). Tarbes fought back with the energy of Yacoubou-Dehoui and the three-point shooting of Eldebrink to reduce the deficit to 4 points(27-30). Hollie Grima who joined Brno this week scored for the guests from behind the arc and drew a foul. She hit the free-throw to complete a 4-point play. Fatimatou Sacko and Charde Houston struggled to make an impact so François Gomez decided to give them a rest. Yacoubou-Dehoui was in her element in the paint and Eldebrink scored once again from behind the arc as the hosts chased after the game (31-34). The coach from Frisco Sika Brno, Jan Bobrovsky, called for a time-out to break the rhythm of their hosts. Tarbes drew level with a trey from Breitreiner and went into the locker room leading with an Eldebrink three-point buzzer beater (37-34). Frisco Sika Brno came out of the locker room more focused and quickly made up their deficit as the two teams traded baskets. The guests went in the lead for good (44-41) after back to back scores from Vitecková and Taj McWilliams (12 points and 7 rebounds) with three minutes played in the third quarter. Gomez called a time-out and made some changes. But nothing was working and the guests with McWilliams and Petra Kulich (12 points) moved 10 points clear (53-43). Houston and Arrondo scored the last points of the third quarter as Tarbes reduced their deficit (47-53) going into the final quarter. 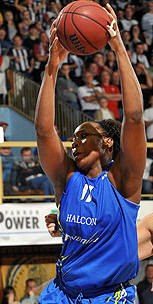 Brno opened the scoring in the final quarter and Sacko finally scored her first points of the game for Tarbes in reply. Another trey from Eldebrink got the home fans on their feet. However Mc Williams was on hand with back to back scores to keep the guests in front (59-54). Arrondo was taken off and Florence Lepron came back in the game. She quickly scored and Houston finally found her scoring touch. Yet it was too late because the clutch shooting from Horakova and Dewanna Bonner kept the guest in front. Frisco Sika Brno held off the final attacks to win (70-62). Lepron finished the game with 6 assists and is amongst the EuroLeague Women assists leaders. Eldebrink scored 23 points while Houston and Yacoubou-Dehoui finished with 12 points each. Lotos Gdynia beat Hungarian club Szeviép (74-61) with Magdalena Leciejewska and Shameka Christon scoring 17 points each in the last game of Group D.